Our December issue is out today, packed with kit to put on your Christmas present wishlist. The arrival of the iPad Mini has shaken up the small tablet market, and along with the Kindle Fire HD and Google Nexus 7 gives you a greater number of devices to choose from. Our tablets Supertest covers all the options with eight of the latest models, from the 7in Nexus 7 and 7.9in iPad Mini to the larger iPad 4 and Samsung Galaxy Note 10.1. Whatever type of tablet you need, don't buy one before you've read the test. We've downsized our TV Group Test this month as well, looking at six 22-26in small-screen tellies, ideal for the bedroom or kitchen. With prices from just £130, they're the ideal Christmas treat. And don't be fooled into thinking they're no-frills – some offer HD, 3D and a few smart touches too. And if you're looking for a budget Blu-ray player to go with your TV, we've tested a cracking new budget spinner from Sony, the £110 BDP-S490. 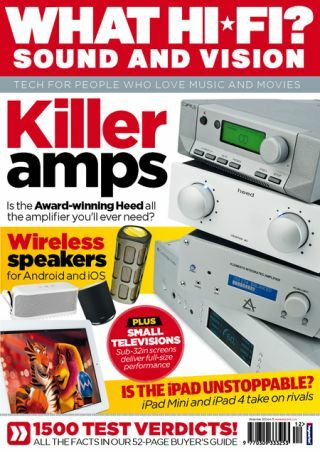 Other First Tests this month include our first look at and listen to B&W's Zeppelin-beating A7 AirPlay speaker, Mission's SX1 hi-fi speakers, the Naim UnitiLite streaming system, Onkyo's hefty TX-NR1010 home cinema amp, an upmarket stereo amp from NAD, the C390DD, and a stylish 5.1 speaker package from Paradigm. For our hi-fi-loving readers, there's a four-way test of state-of-the-art stereo amps in which the Award-winning Heed Obelisk Si takes on the Cyrus 8a, Leema Elements and Cambridge Audio 851A. If you want to give you hi-fi set-up power, poise, attack and musicality, these are the amps to do it. And for those of you more into home cinema, we pit four style speaker packages against each other from B&W, Canton, Monitor Audio and Q Acoustics. Got a smartphone or tablet? Then don't miss our round-up of Bluetooth and AirPlay wireless speakers to unleash your tunes. We've tested eight models from just £130. Oh, and if you have been lucky enough to win the lottery recently, then check out our Temptations section in which we test the superb Naim NDS network music player and the rather gorgeous looking (and sounding) Focal Diablo Utopia speakers. All this and more is in the December 2012 issue, on sale now. And don't forget you can download our Digital Edition from iTunes or Zinio.